December 23, 2015 - Epic Aircraft, manufacturer of high performance, all carbon fiber, single-engine turboprop aircraft, achieved a significant milestone in its E1000 certification program last week, with the successful maiden flight. The company remains on track to achieve Type Certificate and begin customer deliveries during 2016. The Epic E1000 prototype FT1, sporting tail number N331FT, took its first flight on Saturday afternoon, December 19th, at approximately 16:00 from the Bend Municipal Airport (KBDN). Epic CEO, Doug King said, "This is a tremendous accomplishment and I couldn't be more proud of our team. We achieved our goal to fly FT1 by the end of the year, thanks to the hard work, long hours and dedicated commitment of our entire staff. The timing just before Christmas gives us even more to celebrate this holiday season." Upon completion of the scheduled 20 minute flight, Epic Chief Pilot, David Robinson, reported "The aircraft handled extremely well and performed just as expected." FT1 testing will continue over the next several months, assessing general handling qualities, operational performance, systems operations in normal mode, failure scenarios, extreme conditions, and Flight Into Known Icing (FIKI) regulations. The E1000 design perfectly addresses the market need for a high speed, low-cost aircraft that can efficiently support individual owner pilots, as well as corporate, fractional and charter operations. 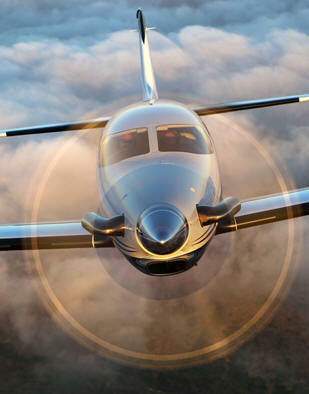 The company expects the E1000 to be a formidable competitor in the single-engine turboprop market, as well as offer business jet owners a more versatile, lower-cost platform. "Traditional metal aircraft are at a tremendous disadvantage. Carbon fiber is lighter, stronger, more aerodynamic and less expensive to manufacture, providing more speed, range, payload, and performance at a highly competitive price. That's why the E1000 will be the fastest, most versatile and affordable, six-place single-engine turboprop in the world," says King. Competitively priced at $2.95 million 'fully-equipped', the sleek E1000 all-composite airframe, powered by the 1200-horsepower Pratt & Whitney PT6A-67A turbine engine, travels at speeds over 325 KTAS, offering a range of 1,650 nautical miles, climb rate over 4,000 feet per minute, authorized ceiling of 34,000 feet, and full fuel payload of 1,120 pounds.